This summer I had the great opportunity to work with new client With One Voice. 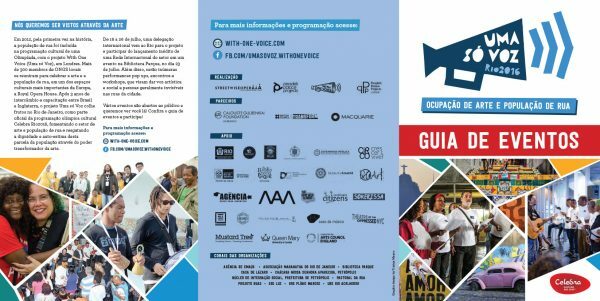 With One Voice is an Arts & Homelessness capacity building and exchange programme that follows the Olympic trail, including the Arts & Homelessness sector as part of the Official Olympic Culture programme. 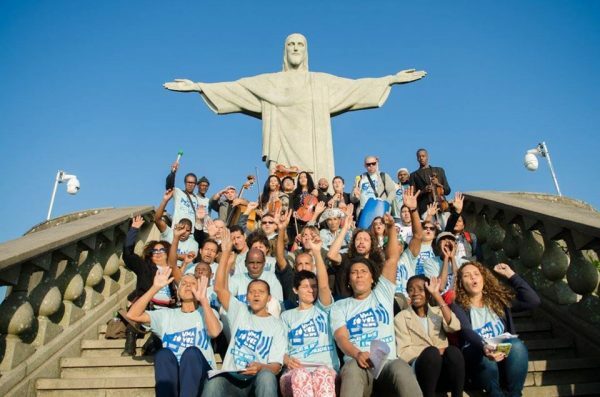 It first happened in London 2012, with a major event at the Royal Opera House, and after 2 years of exchanging programmes, projects culminated in Rio in late July. For the Rio phase of the project I was commissioned to create a logo and brand assets that had a more Brazilian flavour to them, and of course, for it to be in Portuguese. With the new slogan; Uma só voz, Rio 2016, Ocupação em Arte e População de Rua. 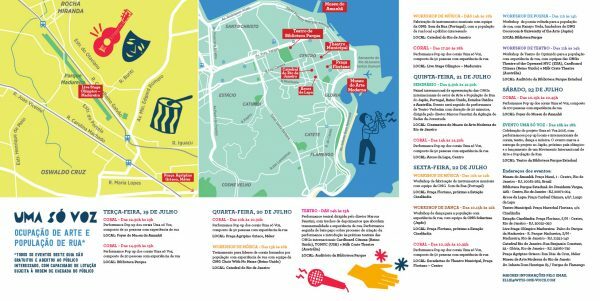 As part of the commission I had to design T-shirts (see above), vinyl banners, social media banners, flyers, programme and an illustrated map of Rio with the locations of events. My visual starting point for the logo was to have an element of the hand-made, since Brazilian art and design is famous for using hand-crafted methods and improvising with materials. I then decided to use masking tape to create the loud-hailer icon in Uma só voz logo pairing it with the Arca font produced by Brazilian font designers Pintassilgo prints. I used the same methods to create a range of graphic icons to show different elements of the arts project, such as music, theatre and dance. I had such fun making the icons that I decided to make an animation with them that the client could then use to promote the event on social media. For the photographic treatment I made created collages of images that reflected the Rio’s famous mosaic stairway – the Escadaria Selaron in Rio’s old town.